Correct me if I'm wrong, but I believe this will make a fine leveling weapon for protection warriors and possibly paladins. Really, I just bought this for the looks. It looks really great. Tell me that isnt a good looking weapon? Added screenshot. Dropped for me off of one of the mobs in Zeb'Halak, Grizzly Hills. Pretty nice for a world drop, looks really cool too, but not very useful for a Mage. I sold this on the Alliance AH for 300g. May be a little low, but it's 300g more than I had before. Just wanted to add that I sold this for 300 instantly on my own sever just now, probably could have gotten more, try for it! I found one of these off of a Silverbrook Hunter. I only killed a few, I was doing A Swift Response. I just looted this off of a Grizzly Bear doing Not even kidding, I about cried cause its the first blue I've looted outside a dungeon since Feet of the Lynx. Alright, I might be over reacting. But off a Grizzly? O_o Guess I cant complain. I sold it for 250G, 2 hours into the auction. Probably would have sold for more, but I wasnt too worried about it. Where is a good place to farm for this? A Tankadin in my guild would love it. Dropped for me (prot Paladin Herculena on Cenarius) off of one of the Drakuru trolls in Grizzly Hills; I was questing with my friend (a rogue) who was nice enough to let me take it. Very nice weapon compared to what I had on (and yes, the glow is awesome). Looks like it has a pretty low drop rate so AH might be your best bet; I think I was pretty lucky to get it as a drop. Actually, I didn't get it off of anything from the list of "could drop froms". I did get it in Zul Drak but not off of the Vargul hound. It was actually off of one of the Vargul guys. Hmmmm. All in all, awesome sword. Looks sweet and nice stats. We'll see what I can sell it for tomorrow. Will let y'all know. Picked this up on my warrior for 100g at the AH. Well worth the money, and the speed makes it good for on-next-swing attacks like HS or cleave. Could also serve a tanking DK well since they have rune strike which is a great threat builder. This sword adds 591 AP to druid forms. Seems a bit odd since they can't use swords. would these be a good to duel wield on a DK? or perhaps an OH for a rogue? Mace is much easier/cheaper to get and gives more evasion. Im wondering who's that Lydia..
No Lydia in the lore as far as WoWwiki goes. So... is the sword suicidal? I've just picked up this Sword now if anyone is interested in buying it, let me know. I bought two of these on the AH on Gurubashi today. One was for 200g and the other one was for 55g. I'm using these for my Frost-specc'd DPS DK. One with the Rune of the Fallen Crusader and one with Rune of Razorice. raising a prot warrior. Which is a more good choice? looted it out of a maplewood chest in one of the camps at indu'le. Just bought one from a warrior for 15g. Was gonna try DW for my Unholy, but I might save it for my Pally. This item has value today for leveling and for transmogrification. YMMV of course but the currently-listed buyout price of 85G is too low IMO. 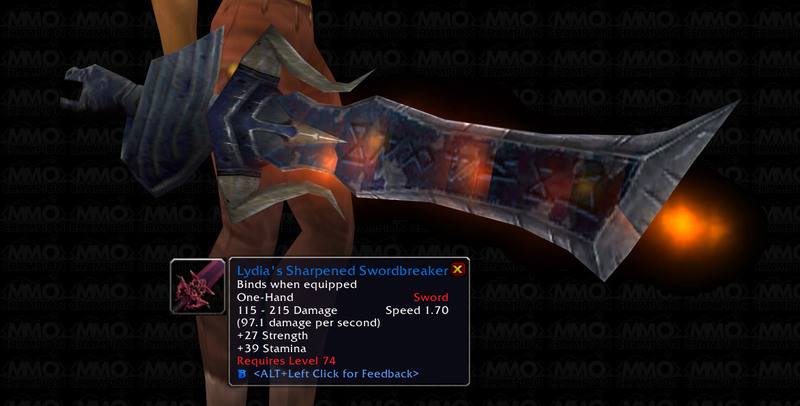 And with today's threat environment it doesn't matter much that this thing is not a slow weap... and by the time it might matter, that toon will be entering Cata zones and this weapon will long since have been discarded or upgraded. The Dragonborn must've gave this to Lydia. I'm sworn to carry your burdens! None of the comments seem to mention the fact that the word "Edsword" is spelled in large, Norse runes on the flaming blade? Got this today from a Salvage Crate. For those that want the replica, without the glow effect, you just need to go into Heroic Oculus and kill Drakos the Interrogator for The Interrogator. Luckily, it's the first boss.. So no annoying drake fights for you if you want the sword!